Split is our starting point and all our tourist products are connected to this picturesque town that easily' gets under your skin'. Get acquainted with it through our photos and words, although it is only a pale copy of this mixture of bustle and idleness and historical cultural heritage. Everyone knows that Split is, as its inhabitants like to say, ' the most beautiful city in the world', Croatian Nice, the city where Diocletian's palace- a Unesco world heritage monument- is situated, as well as a must see city when visiting the Adriatic coast. Everybody knows that. It is written in all the guidebooks, numerous books and videos witness its importance. However, there are many things that 'everybody' does not know about Split, and exactly 'that very secret thing' is what I wish to make my guests acquainted with. We want our guests to have a look at the real town of Split, the most beautiful and at the same time the craziest city in the world. 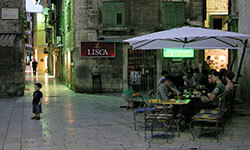 We want to make the visitor the very inhabitant of Split, even if it is just for a few hours or days. Is there in this world a well preserved Roman palace in which common people still live? Not only are the inhabitants of the palace common people, but they are at the same time very special people, with their unique life philosophy of idleness blended with the Split 'dišpet' (spite), which they even honor with a monument ?!? Split is best seen through its picturesque fish and green market, through scenes that in this modern world hardly still exist. We want our guest to be a part of it, to feel the heart and pulse of this city. Our stroll through the city we shall start in the palace, and listen to a mixture of extraordinary stories blended with even more unbelievable sights. Our walk, though, will not finish on purely tourist tracks. We will leave the usual tourist crowds and join local people at the fish market, we will listen to the yelling of eager fishermen, trying hard to sell their fish, while still fresh under the hot Dalmatian sun and ready to share their recipes for the best prepared fish in the whole world. Then we will take a walk to the green market, taste home grown fruits, vegetables and other delicious products, and of course we will bargain, trying to reduce our prices to the satisfaction of both parties in the process. A bit exhausted by the hard work and heat, we will sit down in the living room of all the inhabitants of Split- Riva. By drinking our second cup of excellent but strong coffee we will do what everybody here does- enjoy our life. We wish our guests to experience this Split spirit, as we call it, this unique philosophy of –Dolce vita. If this is not enough our tireless guests will be recommended a short walk to the cult beach of Baće and they will be encouraged to play- picigin- a game with a ball in the shallow sea, invented right here and played both in summer and winter on this lovely sandy beach. Green and fish market keep the palace as if in a sandwich, representing themselves as monuments of modern life. The green market is a very special destination for the guests of Split, who after having serious history lessons like to step into the colorful market, which is open for the locals and visitors all year round. The fish market is also one of the city's monuments. Its white stone and Vienesse secession wrought iron make the offered fish a true treat. The green market is situated between the eastern wall of Diocletian palace , St. Dominic's church and the eastern part of Riva. The bustling green market is a unique experience, with colorful fruits and vegetables and inevitable hustle of picturesque sellers. It has always been a mixture of sea and land, islanders, people of Split and those from the countryside, where both body and mind strength has been blended and exchanged, where personal characteristics of local tradition have been shown through songs, game and jokes. The fish market is in a way the belly button of Marmont street. It has been widened with an open area, but even so has become too small for the ever growing city, for the city used to the scent of fish stew and grilled fish. The fish market is the destination of idle strollers, of retired people and numerous tourists, who are always pleasant surprised when they learn that it is the only fish market in the world completely free of flies, owing to the smell of sulphur springs that are located just there, in its immediate vicinity. In 1979 Diocletian palace became part of the UNESCO world heritage. It is one of the best preserved monuments of Roman architecture in the world. The emperor's palace was built between 295 and 305 as a combination of a luxury villa and a Roman military camp, divided in four parts with two main streets. The southern part of the palace was designed for the emperor and the northern part for the imperial army, servants, warehouses and the like. It was built of the stone from Brač and its decorative details such as sphinxes, marble and stone decorations were brought from Egypt, Italy and Greece. Since the palace was 6 kilometers away from the nearest big city (Salona) it was surrounded by towers (16 towers). There were four entrances into the palace, three from the land and one from the sea. 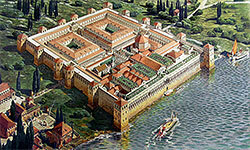 The southern side facing the sea (that one was in Diocletian's time splashed by water) had smaller openings and doors than the eastren and westren side, which were similar and without decoration. The northern entrance was the main entrance into the palace. From the two main streets (cardo and decumanus) , cardo was leading to the peristyle ( open space in front of the emperor's apartment). On the left side there was the emperor's mausoleum (today st. Dominus cathedral) and on the right side there were three temples. The main temple was dedicated to Jupiter (well preserved), and the other two to Cybelle and Venus. Vestibule, the entrance to the emperor's apartment even today looks fascinating. It once had a big dome, and half a century ago people even used to live in it. Buildings from various periods built in different styles have been well preserved, just as the palace itself, that has managed to maintain its historical role up to the present day. When trasforming the palace into the city the emperor's mausoleum was turned into the cathedral. The cathedral was initially dedicated to Virgin Mary, but at the end of the Middle Ages it was renamed and dedicated to the martyr from Salona and patron saint of Split- St. Dominus. Diocletian's palace is perhaps the only Roman monument in the world in which people still live. 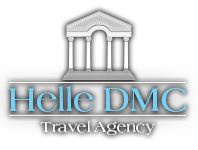 Well preserved peristyle, Diocletian's mausoleum, Jupiter's temple, early Christian churches, romanesque houses, the works by sculptor Juraj Dalmatinac and many other monuments are living witnesses of our rich history. 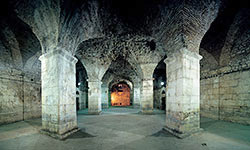 Among the best preserved remaining of the palace is definitive the complex of underground vaulted halls. That complex, sometimes referred to 'as basement halls', is the substructure of the emperor's apartment and is situated in the southern part of the palace. In order to level the sloping land Diocletian's builders built these halls, whose only function was to support the upper part, where the emperor's living quarters were. Because of that function the halls had the same division of rooms as the emperor's apartment. By transforming the palace into the city most of the apartment was destroyed, but on the other hand, the substructures remained almost intact. Differently from the rooms in the upper part that were knocked down or rebuilt, the ground floor was covered with sewage and other waste material, and its walls and vaults have for the biggest part survived. The walls in the eastern part have partly been pulled down, mostly because building material was needed when in Middle Ages the bell tower of the cathedral was built. When we take a walk round the cellars, we can find in most walls original Roman material, the so called opus quadratum, sometimes with chiseled symbols. In the upper layers the wall was built of a mixture of materials- opus incertum mixtum, whereas vaults were made of pumice and bricks. In 1956 the excavations in the cellars started and so far 85% has been excavated. An interesting fact is that in the eastern part of the cellars archeologists have discovered larger areas covered with white mosaics, over which a Roman wall was built, which all indicates that the mosaic had been there before the palace was built. A finding of a hole in one of the halls is related to the sacrificial ceremonies, also belonging to the archeological layer before the construction of the palace.